You’ll make a great first impression when you’re sporting perfectly polished nails. A Zen Salon & Spa offers you first-rate manicures from experienced nail technicians. If you are short on time, our express manicures and pedicures are the perfect option as well. You’ll be able to completely unwind in our relaxing atmosphere at our friendly and clean salon. Rest assured, our salon adheres to the highest safety standards in order to protect your health. We provide the highest quality products from places like OPI, Shellac by Creative Nail Design, Eco-Fin, and Nail Labo. The newest lines from these top companies and our experiences create a flawless look that is not only durable, but will improve and maintain the health of your nails. All implements are sanitized, and a clean pack of implements is used each and every time. Plus we use luxurious products that will smooth your skin, improve circulation, and make your nails healthy and beautiful. A truly pampering experience. Keeping your hands & nails well moisturized is perhaps one of the easiest ways to ensure they remain healthy & flexible. Lotion is always an acceptable moisturizer, and can be applied every day (slather up at night & sleep with organic cotton gloves on for super soft skin). Be sure not to forget about your cuticles, use a cuticle oil every day too. In a pinch you can always raid the kitchen for olive oil (add a drop or two of your fave scented oil and mix it in an old varnish bottle for easy application). Whenever you clean, you should take your hands as a whole into consideration. We aren't a big fan of chemicals (or rubber gloves for that matter) but if you must use one you should always use the other. Protect your skin & nails from drying, harmful chemicals whenever you use them. While long nails are nice, very few of us have nails strong enough to grow very long (which is a crying shame). But we think short nails are just as beautiful and attempting to grow weaker nails can cause splits & damage. Keeping nails trimmed to match the top of your finger is the optimal length. We aren't a big fan of getting your vitamins in pill form…that’s what food is for. But some vitamins are always better than none at all, so if you must, go with an organic, top grade brand. Your nails become much weaker when they are wet (so don’t trim or file them unless they are dry). Also, be sure to dry your nails completely after having them submerged in water (from dishes, the bathtub, etc.) And always wash your nails with fresh water after getting out of a chlorine filled swimming pool or Jacuzzi before drying. Filing can be a rather damaging action for your nails and when not done properly it can lead to damaged or flaking nails. Regardless of the type of file you use, only file in one direction – don’t saw at them in both directions. You can always come in and we'll show the way too! We know it sounds strange what with all of those crazy tools out there to use on them…but if you, your skin & nails are healthy your cuticles will be too. Trimming them can lead to breakage of delicate skin which runs the risk of infection. Keep them moisturized and don’t bite them! Do not use your nails as tools. Get yourself a toolkit with a hammer, pliers & a various assortment of screwdrivers and let them do the heavy lifting. Buffing the surface of your nails stimulates blood circulation to the area and enhances their growth. Always use a good buffer with very fine grit (you can even use the tip of your thumb in a pinch). The best way to keep your nails healthy is to be healthy. That means eating a balanced diet, getting regular exercise and drinking plenty of water while avoiding alcohol, smoke & carbonation whenever possible. 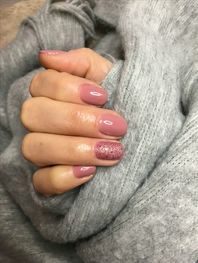 Many of these tips cross over and have similar themes but when it comes down to it, there are only a few things you really need to remember to keep your nails healthy. Keep yourself healthy and protect your hands from exposure to unnecessary chemicals is a great start. Then add in a few minutes of cuticle care and nail maintenance and you'll be on the road to beautiful healthy nails in no time! We can help you get off to a great start or help with maintenance Come on down to A Zen Salon & Spa for your manicure and pedicure today!